There are three sets of animals in life that everybody loves. Monkeys, dolphins, and penguins. Clearly, award-winning developer Microgaming have tapped into this worldwide affection for these non-flying birds by using them as the focal point for the theme of their slot release. Penguin Splash is another joint partnership with developer Rabcat, who have teamed up with Microgaming in the past to produce online slots. 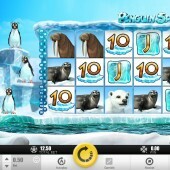 Penguin Splash is a 5 reel, 25 payline slot that immediately takes you to the frozen environment that belongs to the penguins. There isn't a Morgan Freeman narrative in the background and you won't see any penguins dancing but you will definitely come away from this slot with your opinion of the black and white softies only enhanced. The symbols on the reels are stereotypical objects you might link to the freezing cold of the South Pole... and North Pole as a matter of fact. You will find killer whales, polar bears, walruses, sea lions, and the regular 10-through-to-King symbols across the reels. The Wild symbol is represented by the fish. It substitutes for all other symbols across the reels, except for the Scatter symbols, to complete any possible winning combinations that appear on a spin. This slot comes with a free spins bonus round. This bonus feature can be triggered if you hit three or more penguin Scatters across the reels. It is possible to earn up to 25 free spins and if the penguins stay on the ice for the duration of the free spins then all wins achieved during the free spins will be subjected to a 2x multiplier. Rabcat always seem to bring out the best in Microgaming. The innovative Castle Builder slot and the Egyptian-themed River of Riches slot are just two examples of this being the case. Unfortunately, this slot falls a bit flat. It feels like a typical run-of-the-mill Microgaming release that the developer has become notorious for. Personally, you're better off avoiding. 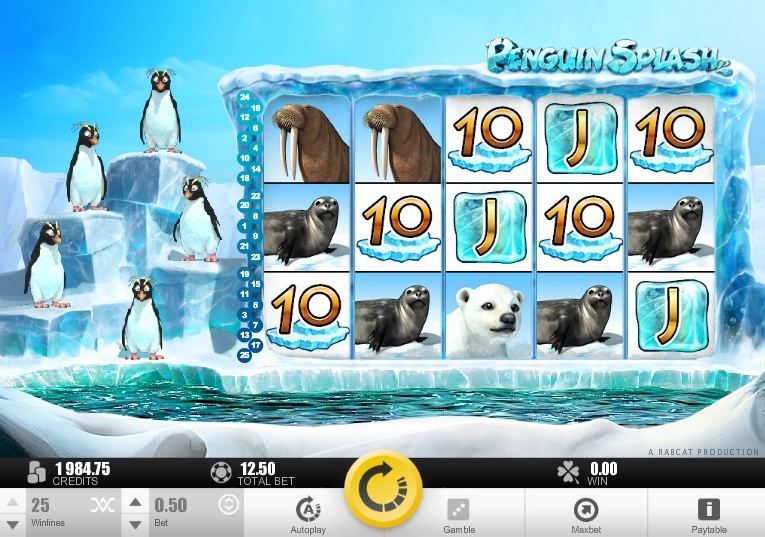 If you're desperate for a penguin fix with your slots then you could always try Penguins in Paradise from Cryptologic.